Core disking has long been recognized as an indicator of high in situ stress in the earth's crust (Jaeger and Cook, 1963). 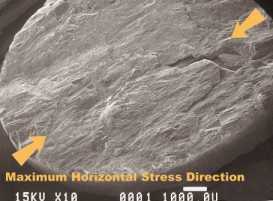 Field evidence suggests that core disking in vertical boreholes is the result of high horizontal stresses. The correlation found in the field has been between the trough axis of the saddle shaped disks and the direction of the maximum horizontal stress. The morphology of the surfaces of the detached disks, examined by a Scanning Electron Microscope (SEM), reveals a set of lineations in the direction of the maximum horizontal stress (Haimson and Lee, 1995). Both the saddle shape and the lineation markings on the surface of the core disks, as observed in the SEM, can serve as additional indicators of the maximum horizontal stress direction. On the other hand, laboratory tests suggest that despite considerable scatter there is a consistent decline in the average disk thickness with increase in maximum horizontal stress (Haimson and Lee, 1995). The usefulness of core disking is in being complementary to other stress indicators and stress measurements both for establishing principal stress directions and for indicating far-field stress magnitudes. Dyke, C. G. Core disking: its potential as an indicator of principal in situ stress directions. in V. Maury & D. Fourmaintraux (eds. ), Rock at Great Depth: 1057-1064. Rotterdam: Balkema (1989). Haimson, B.C. and M. Lee, Estimating in situ stresses from borehole breakouts and core disking - experimental results in granite, Proceedings of the International Workshop on Rock Stress Measurement at Great Depth, The 8th International Congress on Rock Mechanics, Tokyo: Balkema (1995). Haimson. BC and M.Y. Lee, Borehole breakouts and core disking and their complementary roles as in situ stress indicators; an initial laboratory study. EOS - Trans. Am. Geophys. Union. 75: 677 (1994). Jaeger, J. C. and N. G. W. Cook, Pinching-off and disking of rocks, J. Geophys. Res. 68: 1659-1765 (1963). Lehnhoff, T.F., T.K. Stefansson and T.M. Wintczak, The core disking phenomenon and its relation to in-situ stress at Hanford, SD-BET-T1-885, Rockwell Hanford Operations. Washington (1982). Obert, L. & D.E. Stephenson. Stress conditions under which core disking occurs, SME Transactions, 232: 227-235 (1965). Stacey, T.R., Contribution to the mechanics of core disking. J. S. Afr. Inst. Min. Met. 82: 269-275 (1982). Sugawara, K., Y. Kameoka, T. Saito, Y. Oka and Y. Hiramatsu, A study on core disking of rock, Journal of Japanese Association of Mining, 94: 19-25 (1978).